James O'Neill, New NYPD Commissioner, Came Up Through The Ranks : The Two-Way James O'Neill, a 33-year NYPD veteran and champion of neighborhood policing, will replace outgoing Commissioner William Bratton. 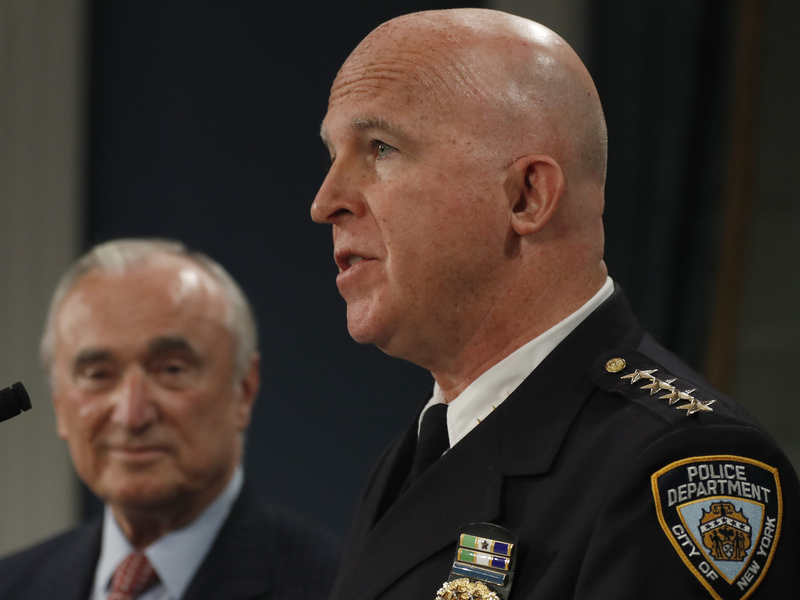 New York City police Chief James O'Neill (right) will succeed Commissioner William Bratton, who will leave the job next month. James O'Neill, the man chosen to replace outgoing New York City Police Commissioner William J. Bratton, has a track record as a law enforcement innovator who is popular with the department's rank and file. O'Neill's promotion by New York Mayor Bill de Blasio was announced along with the news that Bratton will step down next month. O'Neill, 58, is currently the NYPD's chief, a post he's held since 2014. He's been a New York cop since 1983, when he began as a patrolman with the old transit police department. O'Neill worked his way up through the ranks in more than a half-dozen precincts in Manhattan and the Bronx. Along the way, O'Neill became an advocate for what he calls the "neighborhood policing model." Officers under his command at the Bronx's 44th Precinct were evaluated on how successful they were at reducing crime by getting out of their patrol cars and establishing better relations with residents. Raw arrest numbers were de-emphasized. Instead, officers were instructed to take time during their shifts for face-to-face contact with the public. Crime and arrests are down, as well as the police tactic of "stop and frisk." "Fighting crime is what we get paid to do," Chief O'Neill said in January. "But we can't do that unless we have the backing of the community. Unless we have that connectivity, it's not going to work." One blemish on O'Neill's record nearly derailed his career. In 2008, O'Neill was leading the narcotics division when three subordinates were caught paying informants with drugs. He was transferred to the fugitive enforcement division and reportedly came close to quitting in 2013 before Bratton encouraged him to stay on the force. Within a year, Bratton brought O'Neill on to his executive staff. Even before O'Neill's promotion was made official, officers quoted by the Daily News welcomed the news. "He's a solid guy," said Roy Richter, president of the Captains Endowment Association. "He would be a good selection if that's who the mayor chooses and if the position becomes open." Lou Turco, of the Lieutenants Benevolent Association, chimed in with a similar sentiment. "He'd be an excellent choice to be a police commissioner," he said. "He's a cop's cop — 100%." In a 2015 TEDx Talks appearance, O'Neill acknowledged how difficult it is to promote police-community relations in the wake of incidents such as the police killing of Eric Garner. "Since the Garner incident I've gone to 400 or 500 community meetings. In each and every one of them I've gone to, people tell us 'we want policing that's something that's not done to us, but done with us.' And now this is what's happening and it seems to be working."